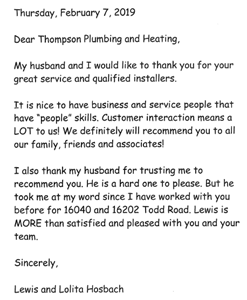 At Thompson Plumbing & Heating we strive for 100% satisfaction in everything we do. We value your opinion and invite you to tell us and others about your experience with us. Please take a few moments to tell us what you think by leaving us a review here on our website or on any of these popular review sites or social networks. Thank you to Ray that came out so fast to work on our Geothermal. He was very pleasant. I have been a Thompson customer for a decade there service and support is top notch. The have a friendly and knowledgeable staff. They are prompt to respond to emergency calls and are reasonably priced. I would recommend Thompson to anyone. I had Thompson come out to my house to repair my furnace. I was surprised how quickly they got my unit up and running. Very professional and even took the time to explain why I was having the problem. I will use them again if needed and highly recommend them. Gary was awesome, did a great job and was very knowledgable. I just returned from hosting the furnace replacement at our daughter, Kristin, home in Milan, Michigan today. I want to express to you both as the owner and manager of the firm, that Installer / Technicians Joel and Ryan did an OUTSTANDING job !!! Right on time !!! Very efficient!!! Very positive attitude!!! Very considerate!!! Very knowledgeable !!! Very courteous!!! Very professional!!! Very clean!!! 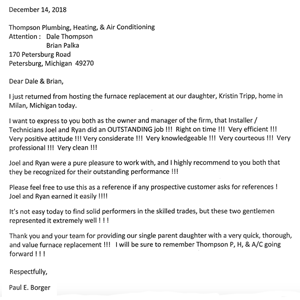 Joel and Ryan were a pure pleasure to work with, and I highly recommend to you both that they be recognized for their outstanding performance!!! Please feel free to use this as a reference if any prospective customer asks for references! Joel and Ryan earned it easily!!!! It’s not easy today to find solid performers in the skilled trades, but these two gentlemen represented it extremely well!!! Thank you and your team for providing our single parent daughter with a very quick, thorough, and value furnace replacement!!! I will be sure to remember Thompson P, H, & A/C going forward!!! I want to say I was very happy with the service tech, Cameron, who came out to see what was wrong with our furnace tonight (11/1/2018). Cameron was very helpful and nice to my father, Royal Billing. And to the woman in the office, thank you for the kind words. Cameron did a wonderful job w/ repairs and his concerns about other issues. You are blessed to have such a good worker. Thank you. Shannon did an amazing job and went above what was expected. I have made a previous review, in the past month for my own experience. I contacted Chris Hill, today (1-4-2017) in regards to my Mother-in-laws residence. 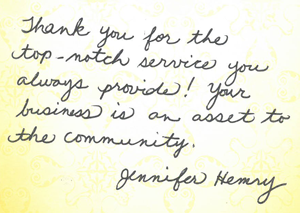 She had been in contact with another local heating & plumbing company, that took their sweet time doing everything! She has a older boiler unit, & I sent Chris a message just asking if he could possibly go over to her place & take a look at her situation? Not only did Chris, get over to her house that day, he was there within about an hour of my contacting him. Then to top it off, a problem she's had with her heat (NO HEAT) for almost 2 weeks! Chris (Brian also) did not just give her a really good estimate on a new boiler, they are installing it starting tomorrow morning! Wow! This company has recently gone above & beyond my expectations! They put the customer 1st. At least in my experience they have impressed me in every aspect of the word! 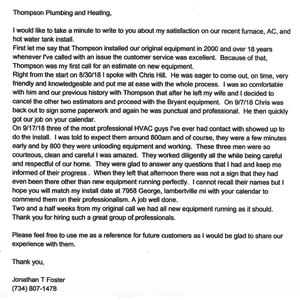 There is absolutely no question in my mind, that Thompson Heating & Cooling in Petersburg, MI. Will always get my business in any problem that I encounter with Heating or Cooling! If it was possible, I would give them a 10 star rating! Product or service reviewed: Was a service call for no heat originally! Well let me start by saying, I made calls to 3 different Heating & Cooling on 12/2/2016. My home was a nippy 62 degrees inside, so I needed heat! It was also on a Friday (most likely a higher cost) to get it fixed before the weekend. When I first noticed our furnace was out, I looked at the board for a code. (A L.E.D. usually flashes a certain number of times) It was flashing 9 blinks then a pause, that code detects a problem with the igniter. In my experience, changing the igniter is very simple. So, I attempted to dive in & get started! BUT WAIT! When I looked closer at the circuit board, I noticed a small black sooty spot, that was not there in the past. I decided @ that point, I needed a pro! I took a shot & drove over to Thompsons (Petersburg, MI.) hopefully for some advise as to what might cause this burnt looking spot on my circuit board! Let me just say, that I walked in at the perfect time! I meet a gentleman named "Christopher Hill" I showed him some pictures I took of the board & explained my issue. ... His 1st response was "You had a power surge" & that he needed to come look at it personally to diagnose it. With no appt. & no call ahead of just showing up, this man was at my home at the exact time we discussed. After he was able to look my furnace over throughly, he was convinced it was caused by a spike in electricity suddenly, for no apparent reason! He explained that although a replacement board & igniter would get me back up & running, & also get some heat back in my home. But!! A power surge is quite possibly a dangerous situation! He advised me to call my homeowners insurance Co. Little did I know, that surge may have comprised some key safety components within my furnace. So, in closing as I type this out. I have a brand new furnace being installed in my home, in just over a week of my 1st contact with Thompsons! If I would have just went in to Thompsons & purchased the parts I needed & nothing more. I could have inadvertently put my Family & myself in jeopardy of a house fire! It may seem kind of "overboard" but in a round about way, Chris Hill taking a personal interest in my situation, could've easily avoided a potentially fatal incident in my home! NOW! Tell me that's NOT a business that puts the customer & their safety 1st! I RECOMMEND THOMPSONS HEATING & COOLING IN ANY PROBLEM, BIG OR SMALL!! Thank You, Chris! 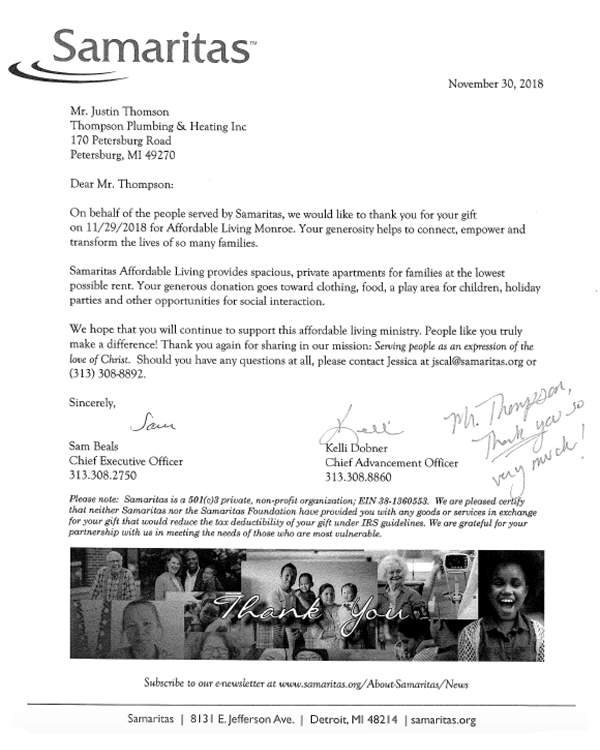 & Thank YOU Thompsons! You have earned a life long repeat customer here! Charlene D. & John R.
I just want to say thank you to you and your staff. We replaced our furnace 3 years ago and just had central air conditioning installed this summer. Everyone we dealt with were wonderful. They had great attitudes, a great work ethic and very personable. 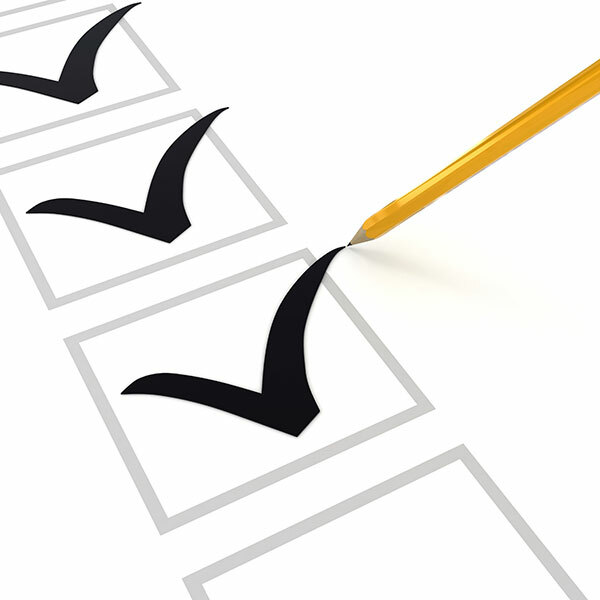 Your company and its employees are very trustworthy and do a fantastic job. I was so comfortable with your installers that I even mowed my grass while the air was being installed!!! We will definitely use your services in the future and we refer everyone we know to you. 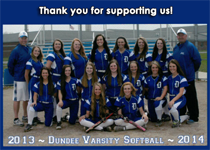 I want to thank you for the advertisement you placed in the Dundee High School Hall of Fame! It helped the financial support of paying the expenses for the ceremony! It was great, and I was blessed to be included in the induction class of 2015. I want to thank you at Thompson and especially Brian for the quick service and installation that you did for me the other day. Your service was great. We wanted to let you know how happy are to have chosen your company to install our new Evolution system. We have only been experiencing the system for a week now but have been very comfortable. We even “fired up” the heat pump yesterday morning as a test and it brought the entire house temp up 2 degrees in less than an hour. We received our propane budget contract yesterday and I called them, saying we really don\'t know what to expect over the next year\'s heating season but know we will be using much less propane fuel going forward, that\'s the only reason we\'re looking forward to winter! 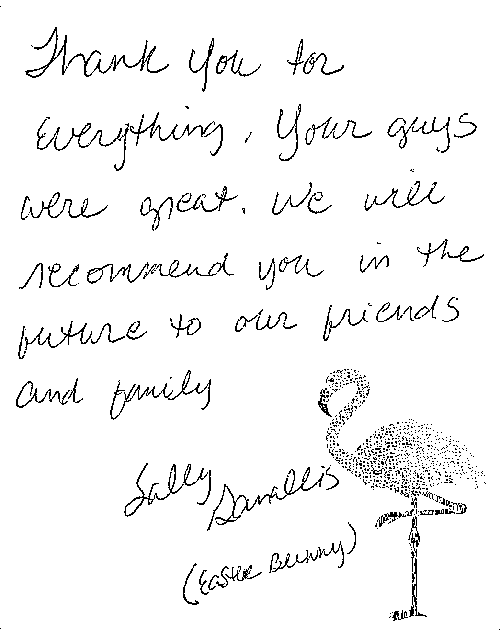 Your crew was so excellent and professional and offered such a great solution to our long-time problems. 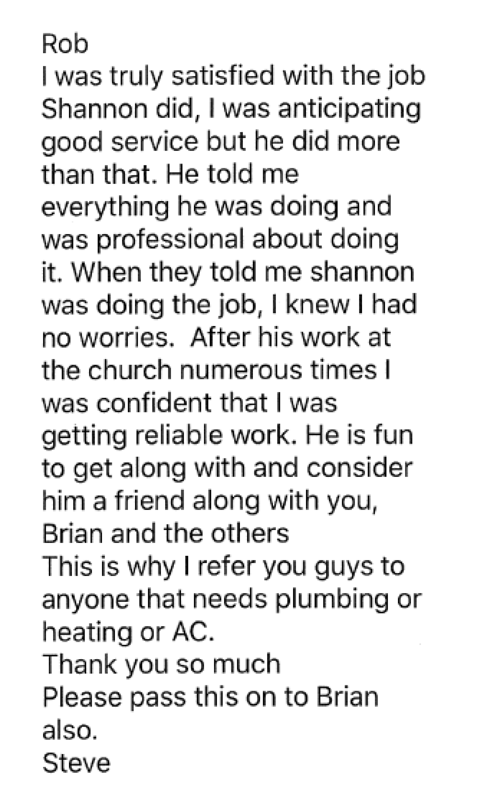 We first met Shannon for the service call and he very thoroughly explained what he had to do to get us up an running. He also explained the benefits of an update or replacement of our 20 year old equipment. Chris followed, and made multiple visits to consult and measure. He was excellent at explaining how an Evolution system would benefit us and most of all sealed our confidence in doing business with you. Installers, Mark and Joel were wonderful, so knowledgeable and proficient at their trade. We still can\'t believe they replaced 95% of our duct work with a totally new and more efficient layout and installed the furnace and heat pump in two days! Thank you for a job well done! I wanted to take a minute to let you know that the guys that you sent out Friday were extremely professional and represented you and your company above and beyond. We will definitely use and recommend your company in the future. Thank you for an excellent job. Your employees were efficient, friendly and very considerate. We have recommended you to a neighbor. Muller Pipe Organ Fitting Co., Inc. The installation crew was on time and very productive and professional through out the installation of the new heating and air condition units, the work area was kept clean and safe there was no slip trip or fall hazards from the demolition and removal of the old furnace and air conditioner. The new furnace and air conditioner was very professionally installed, the installed units look great. Chris Hill did a great job of evaluating the old system and recommending repairs and replacement of the old furnace and air conditioning systems, he also noted during his inspection and evaluation of the old system a couple of code violations that needed upgrading and repair, these repairs were noted on the proposal and accepted for repair by me. Thanks to Chris and Bryan for a well-planned and installed project. 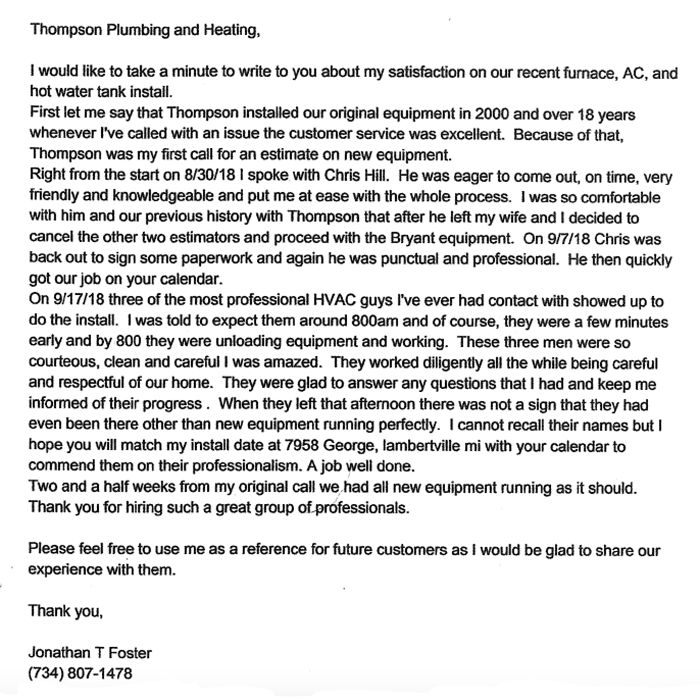 Just a short note to let you know about our experience with the employees of Thompson's this past week with the purchase and installation of our furnace, air conditioner, and water heater. We called for prices and general information and found, as usual, the people are very pleasant and knowledgeable. Once we decided to go forward with the project, Chris Hill came to the house. He answered all our questions and explained everything that would happen. He even rinsed out the igniters so that the old furnace would fire up better until the new furnace could be installed – great guy! The installers got here on time, got right to work, had great attitudes – very friendly. They explained what needed to be done, worked fast and again answered all our questions. When finished, they showed us how everything worked, like how to set the thermostat, how to relight the water heater, and how to change the furnace filters. They even cleaned up everything when they got done!! This is why we always call Thompson's and recommend you to everyone!! Rich and I just wanted to let you know that Shannon the service tech went above and beyond the call of duty this weekend for us. Our furnace went out and he told Rich what to do with furnace, but when I woke up at 6 am Sat the heat was going down at 66. He came back on Saturday and it was a different code that he didn't have the parts to fix it, and told how to keep it warmer in here. So we did what he told us and it was toasty warm in here. He even called us later on and asked if we were ok with the things he gave us to stay warm. Then Monday came and said he had part and would fit us in. We now have heat!!! but Shannon was a great help and very polite. We will ask for Shannon from now on. 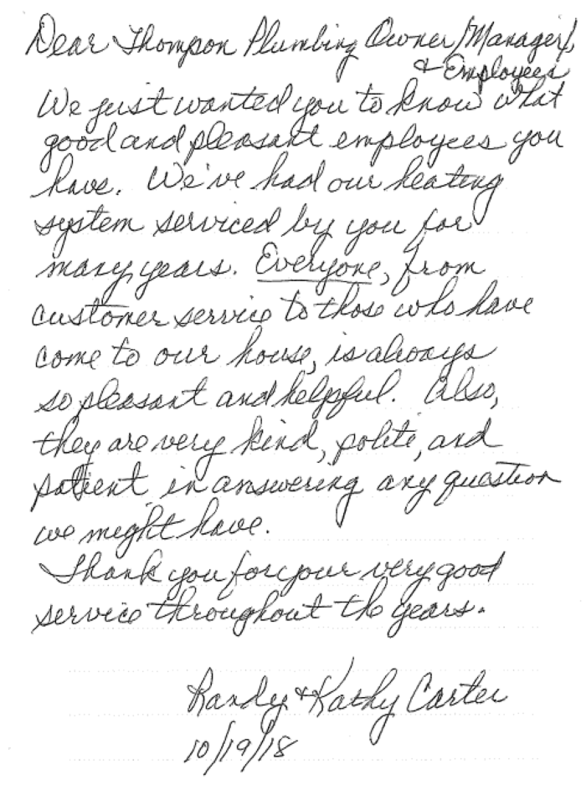 I wanted to say thank you for your quality service and friendly, professional staff. Ever since working with your company at the Detroit Light Guard Armory project, I've been impressed. As a result of the relationship I developed with your company, you have earned a customer for as long as I need plumbing and HVAC services‎. Thank you for your continued support. Jan. 7th, this year your company installed a new furnace. 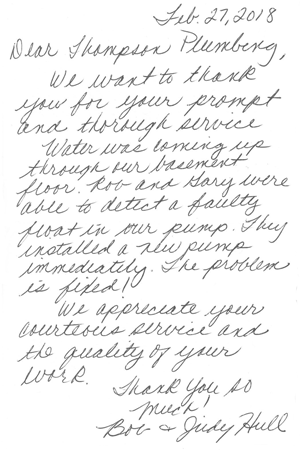 The 2 service techs were very polite as well as professional. I've known Shannon Casto for many years. Even though he was going through a family crisis, he still took care of things for me through Thompson. He spoke highly of you and his words were Thompson is a great company and I would be in good hands...very true words. Too add to that there was a gas leak outside which your tech made the call with me explaining the issue. The service tech who responded from the had company had this to say. Of all the furnace companies he\'s dealt with in his career, Thompson is the most easiest to work with. I thought that said a lot too. We had wonderful service with the installation of our new generator. I got your note regarding the recent service trips to my house. I very much appreciate your assistance and cannot say enough good about all of the people who took part in getting everything in order after the power surge at my house. I've always had good relationships with anyone who has helped me and that goes double for this recent ordeal. Thanks to Kris, Brian, Dave, Justin, Pete, the office staff, and anyone I might have missed mentioning. Love y'all! 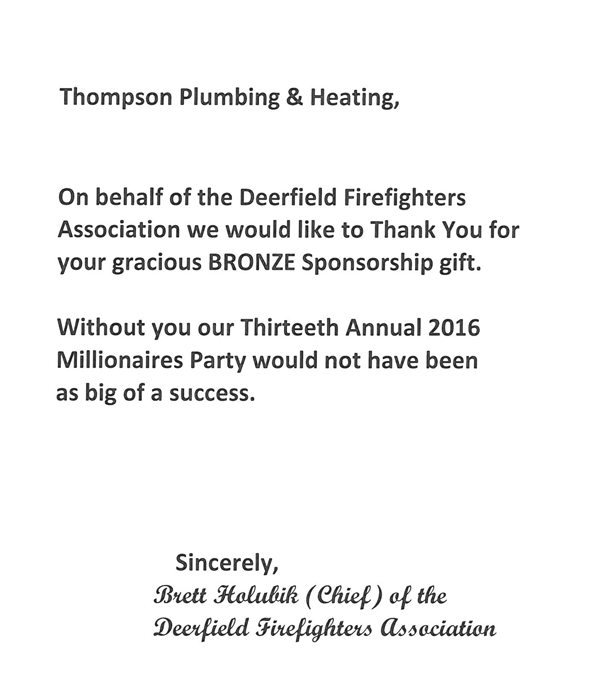 Thanks Thompson Plumbing & Heating! My house is nice & toasty now! I cannot thank you enough for the fantastic service yesterday. We are so warm and comfortable now thanks to the hard work your tech. Wishing you much success in the new year!! Thanks for such a fast turnaround! Our brand new central air unit is working great! I will be recommending your company to all my friends/family/ect. Courteous, respectful and all around nice people in both the office and the field guys! I was very happy when I called and Brian Palka told me you had a GEO unit in stock and available. I had been waiting over a week with the other heating and cooling company, and I was going to have to wait longer for the unit to come in. 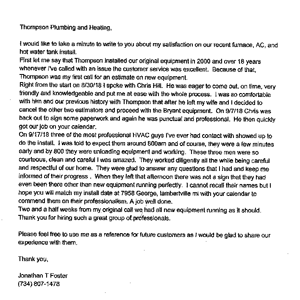 I had worked with Thompson\'s in the past and have always received good service. I do have questions on occasion, but when I call or text Brian, even at 9:00pm, he promptly replies. Thanks for the support. Dave and Andy had the old system out and the new one installed, in one day. It was a complex wiring system, so Chris Hill took over and worked doggedly until everything was perfect. I don't know how many people have boiler/baseboard heat, but this system never makes a noise, always maintains the different areas of the house to the exact temperature set (we like our bedroom colder at night). I'm not saying it's a better heat than say 'forced air', but it has some definite advantages, my last system lasted 40 years. I wish I'd ran tubing under the kitchen floor before I tiled; maybe I'll talk to Chris Hill about that! 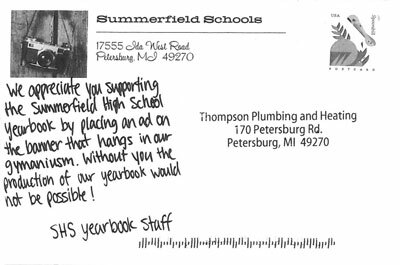 Thank you for your support of the Summerfield High School yearbook. We appreciate you putting an ad in our 2013-2014 Summarium. Thank you for the recent job you did on our remodeling. Your staff is prompt and do not waste a minute. They are very professional. I would not hesitate to call them for future needs and recommending them to others. Also thanks for recommending Richard Bird, another professional. Again you sent out a very polite man. Keep up the great work! Thank you for the great service today. Bob was very professional installing our hot water heater. He was professional, patient and persistant when he had to return a second time for another problem. Thank you for accomodating me on my day off. We will call you when we're ready for that furnace and AC. Please put me on your mailing address. 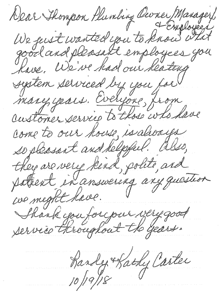 I want to thank you again for the fine service you provided when you put in our new furnace. It is working great. Happy New Year. 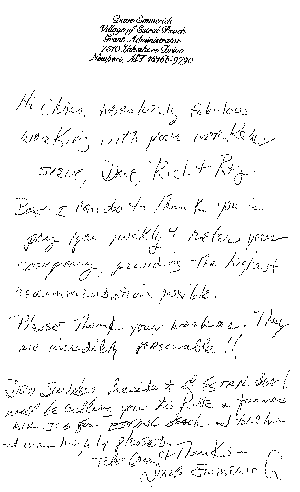 This email is just to let you know that we could not be more satisfied with the new furnace. The problems with the old one was explained to us so clearly (even a picture on the camera). The new one was installed so fast. Thank you and we think you are doing great. Thank you for the very generous donation of miscellaneous food you gave to the Dundee Caring & Sharing program. With donations like yours, we continue to help the less fortunate with their groceries. These donationa have been put in our food pantry for the continued ministry of distributing food to those in need in our community. 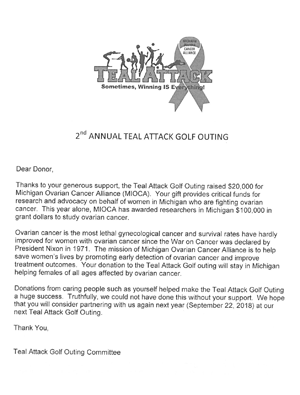 Thanks again for your generous donation and your continued support to our program. 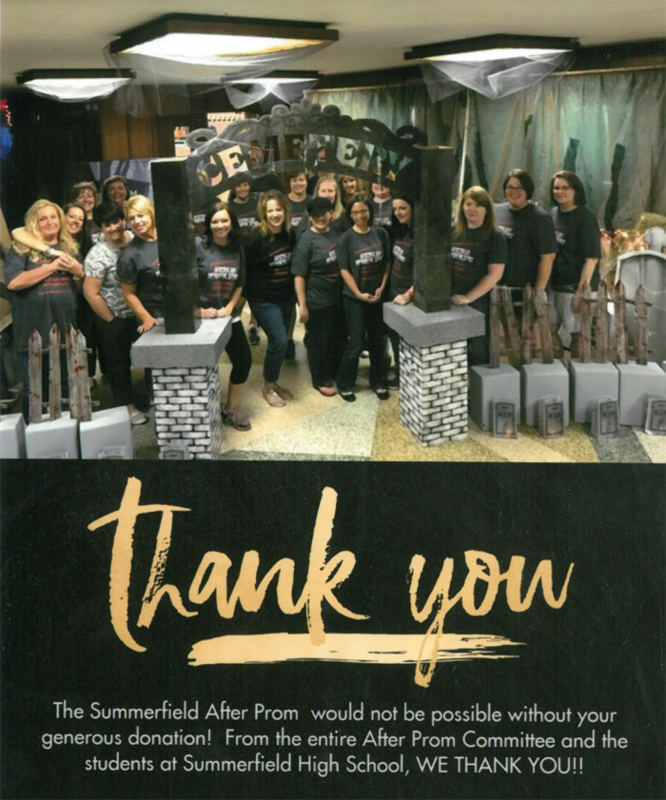 To Whom It May Concern: The staff at the Summerfield High School yearbook, extends our appreciation for your support of our school. 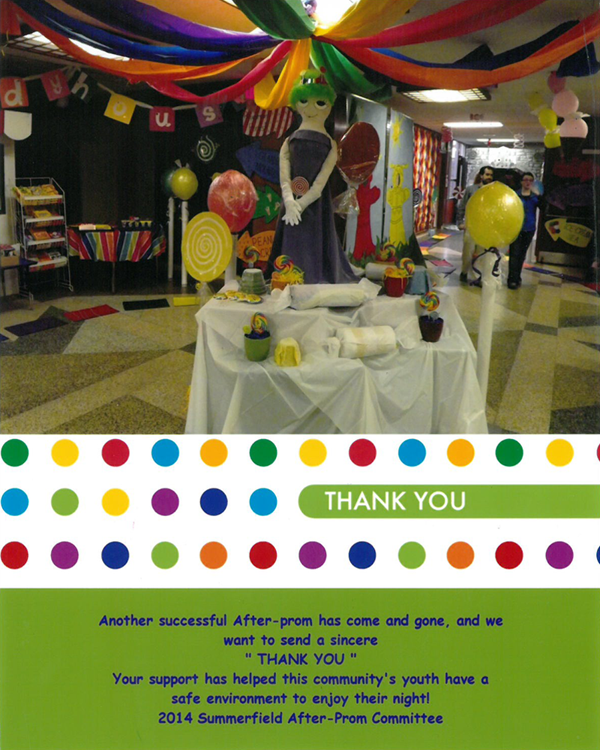 It is only through contributions from the businesses like yours that we are able to produce the yearbook. Thank you again for the donation. I was very pleased with the professionalism of your serviceman and with the prompt and efficient work that was completed that morning. I will contacting your office again to schedule some additional plumbing services. 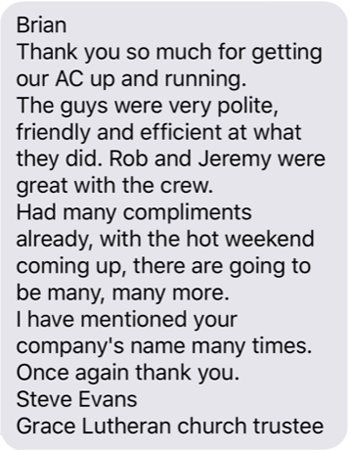 We would like to commend Jeremy- very hard working—especially in the terrible heat when replacing the A/C. Very conscientious and valuable employee!! We recommend your company to our neighbors, both these referrals resulted in installations. 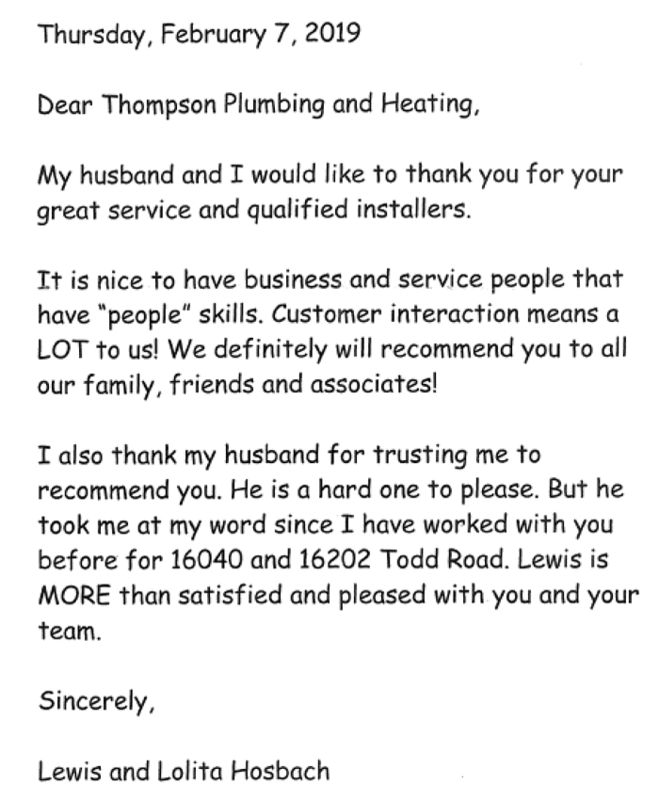 We will continue to recommend Thompson's. I had a generator installed July 11th by Thompson & Iott. They did a great job. They arrived on time, explained everything, cleaned everything up, and I am very pleased. Very nice polite young men. Now I don't have to worry about power outages. Thank you & please send me any coupons & special offers. I sure am enjoying my central air conditioning this summer! THANK YOU! Thank you so much. Your service guy was very professional and did a great job. You are an answer to my prayer for me. Was going to post a big thank you on facebook about customer loyalty. It is rare in todays age that it means something to a business. I appreciate all the work you guy-and gals- have done for us!! I recommend you any chance I get. Thanks Brian for your help today!! 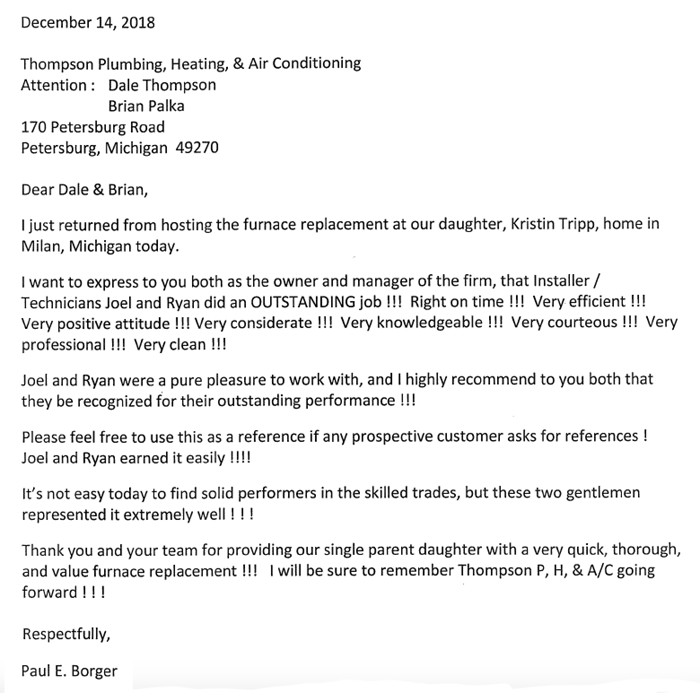 I was very pleased with the way Chris H handled my furnace problem. He answered all my questions and did a good job of explaining the pros and cons of repairing it or purchasing a new one. After talking to him I\'m sure I made the right decision in buying a new one. Thank you for your generous donation of canned goods from your food drive and Visa gift cards for $700.00 you gave to the Dundee Caring and Sharing program. With donations like yours we continue to help the less fortunate with their groceries. These donation have been put in our food pantry for the continued ministry of distributing food to those in need within our community. 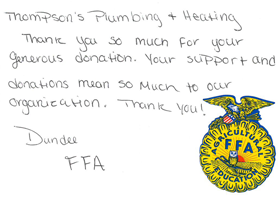 Thanks again for your generous donation and your continued support of our program. Thank you so very much for your prompt, polite, professional service. I was quite impressed with the top rate customer service I received from all 3 of the men I dealt with, Justin, Chris & Ray! I will most certainly recommend your company to others. I received your letter wanting to know if everything was O.K. with your workers and service. 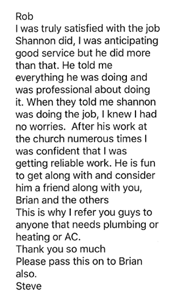 I just wanted to personally thank Brian for getting the work done on our water heater even before the work on our furnace was done. Our 6 yr. old son was having headaches, and after the water heater pipe was cut off and fixed right, he has had no more headaches!!! I had 2 other furnace places out to give me estimates also, and neither one noticed the water heater pipe like Brian did. Again, that meant alot to us, knowing now our son is no longer getting sick from the carbon monoxide it was putting off. Our furnace works great and our bill seems to be lower for heat than it was. So all in all we are happy!!!! Thank you again and all of you have a Happy Holiday!! Your local Dundee Bob Evans would like to thank you for participation in out Thanksgiving drive to feed local families. Your Generous donation, combines with other local businesses and our customers donations to this program, made it possible for us to donate farmhouse feast meals to 20 families this year. Our restaurant is partnered with a local soup kitchen that identified these families and delivered their meals. 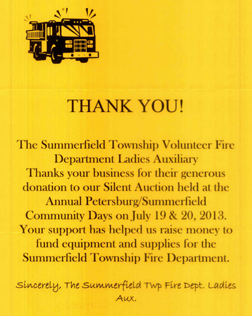 We greatly appreciate your donation and look forward to your continued support in the years to come. Please help us spread the work so next year we may be able to increase the number of families we provide meals for. Thank you again and Happy Holidays. 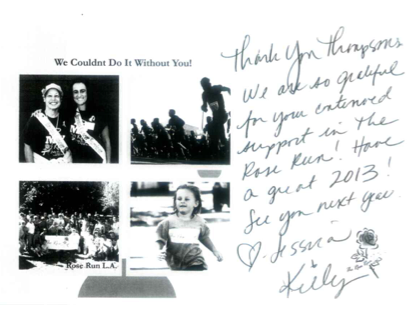 Thank you so very much for your support in the 2011 Rose Run. 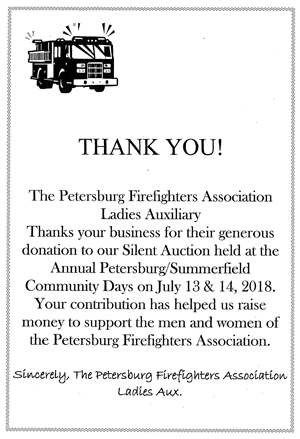 This year’s run raised over $10,000.00 to put us at a grand total of $31,455.22 raised for The Breast Cancer Research Foundation and the The Volunteer Fire Department in Petersburg, Michigan. 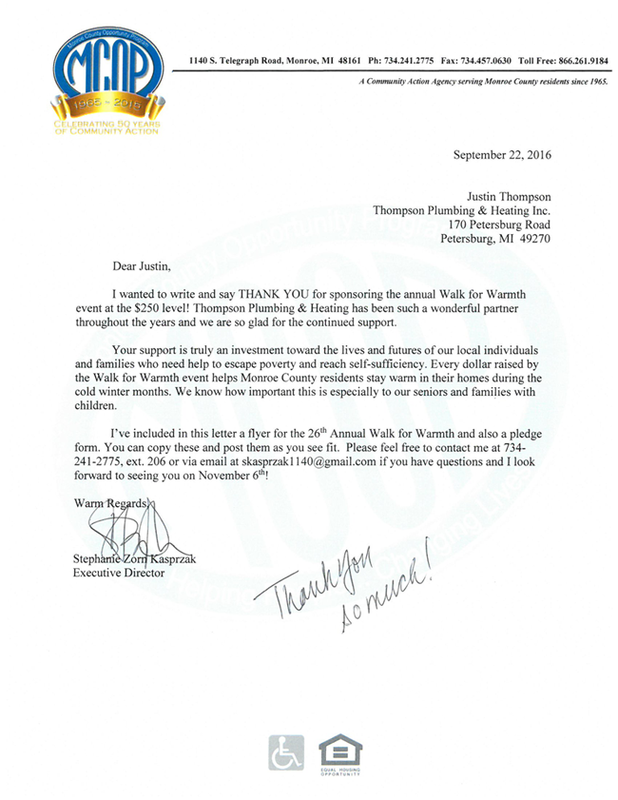 What started out as a small idea has become a largely successful event in a small town. We truly could not do it without you. Thank you. What a wonderful thing you have done giving away the New Bryant Furnace. I am so grateful we’re the recipient. Thank you again so very much. During the recent 90° days, we were happy to have a functioning air conditioner which worked flawlessly. I also appreciated the expert advice I received over the phone when I had a question about the new air conditioner last week. 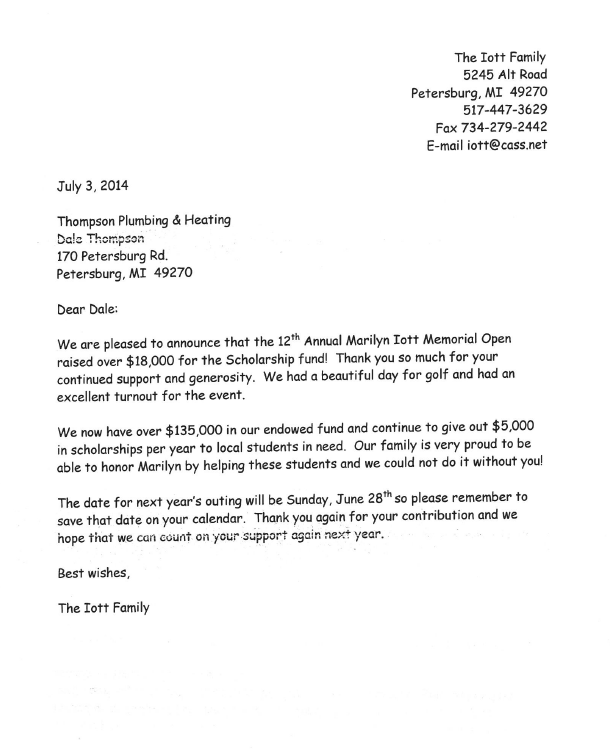 We are excited to announce that the 9th Annual Marilyn Iott Memorial Open this past weekend was a huge success. After all expenses were paid, $18,318 will be added to the Scholarship Fund! That is our best year ever and we can’T thank you enough for your support. There was an excellent turn our for the event, everyone braved the ehat, and all the golfers seemed to have a great time. 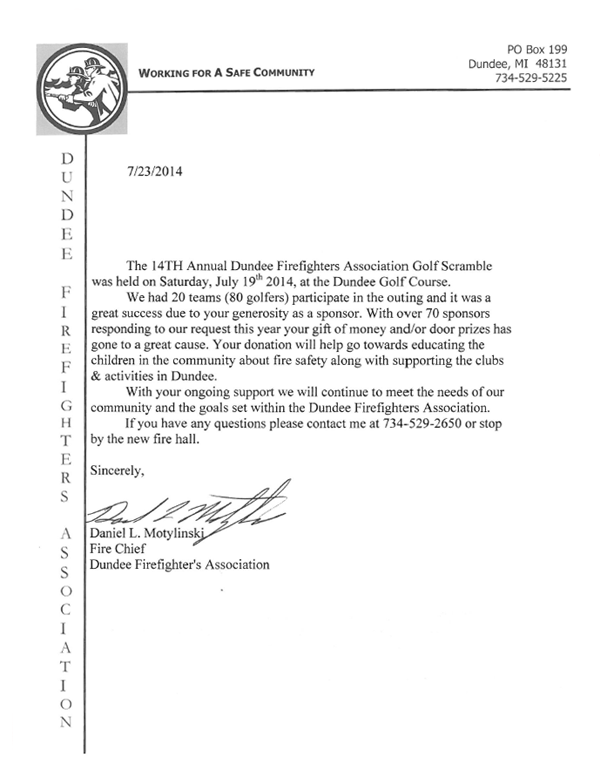 Our sole method of fundraising for the scholarships is this annual golf outing. 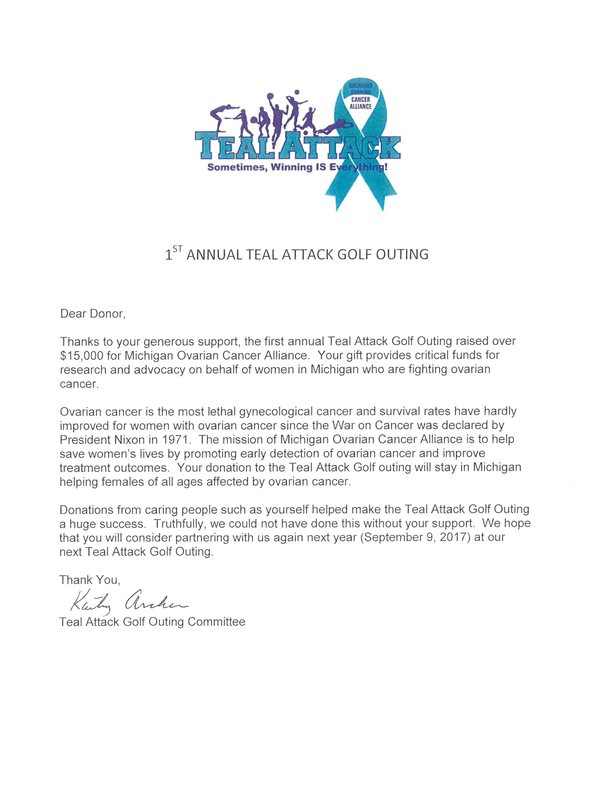 It is because of YOU, our loyal supporters and golfers that we are able to make this happen. These scholarships are making a big impact in our community and we know Marilyn would be proud that all this is being done in her honor. Thank you for your contribution, and we will be in touch again next year. Thank you for participating in the Mercury Recycling Program. Because of responsible companies like yours, we are able to continue protecting Michigan’s air & water from the harmful effects of mercury pollution. I called for an estimate to repair a heat pump at a home on Trost Road. After our conversation, I expected an estimate for replacement. What an unexpected surprise to find an estimate for repair on my desk! Thank You! I sent it along to the buyer with a resounding recommendation to use you for repair or replacement. Thanks again for your time. I want to take this opportunity to say thank you for the generous donation toward the annual “25 Changes Lives” Campaign. 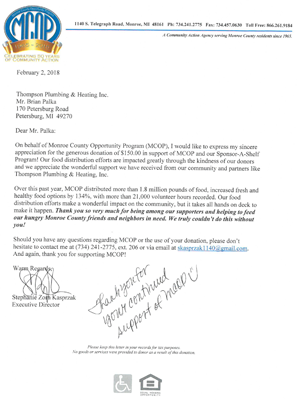 As you well know, MCOP is working in the community to reduce the effects of poverty and improve the quality of life for Monroe County residents. Through this campaign, we are able to serve those who would otherwise fall through the cracks. During this challenging economy, we continue to work hard providing opportunities for our neighbors to become self-sufficient. This can only be done through the generosity of people like YOU. 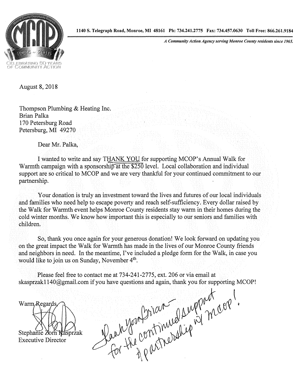 So again, I thank you for supporting MCOP and look forward to our continued work together to make a difference. I’ve been wanting to write & let you know what a wonderful experience I had with dealing with your company. I had dealt with a Monroe Company for many years & had not been happy. Calling you was the best thing I’ve done since the last time I called you to install a water heater back in November. Being a single women I have ran into more bad experiences, from being talked down to, for being inexperienced to whatever line of work we were dealing with. It was a pleasure and almost painless (except for the bill). I have only one regret, that I did not call sooner. You are on the top of my list, you will be the only one I call I the future. I thank you again. On behalf of CCVCA, I want to thank Thompsons for the donation again this year for the Bedford Relay for Life. My experience was very good. The technician was very cordial and helpful. He went out of his way to protect the floors and work area. I appreciate the good price and service. Now that I have a new air conditioner we'll probably have the coolest summer on record! Both crews did a great job. Worked efficiently, installed properly, cleaned mess, pleasant work attitudes. Thank you so much for such quick service. I really appreciate it. I am very satisfied with the work & hot water tank. I have lived in the house for about 5 years now. We really never had hot water and if we did it would run out very quick. Now we can all (5 of us) take a shower and we never run out. Thanks again and I will recommend your company to anyone who may need your services. 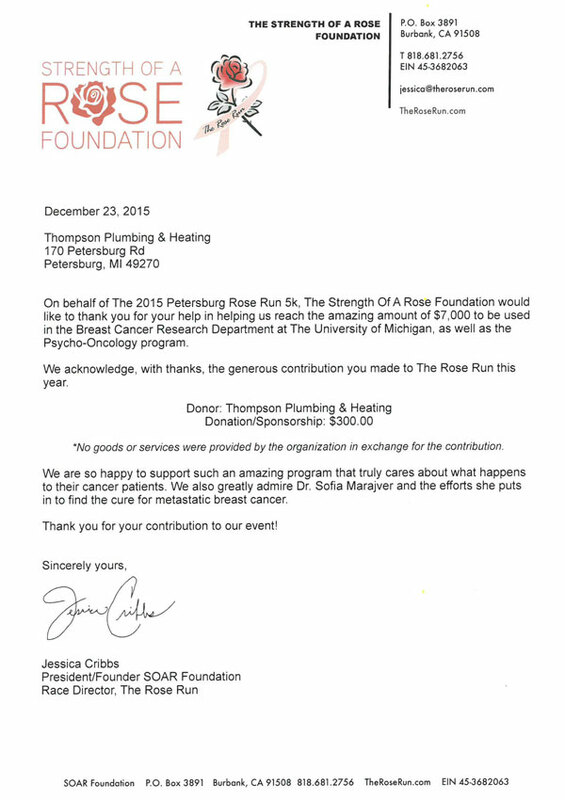 Thank you so much for your donation to our fundraiser. 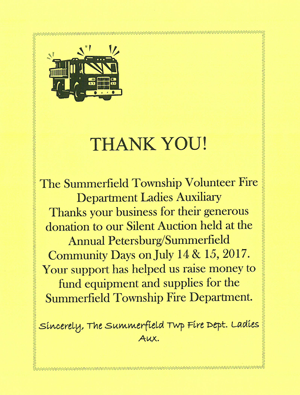 We truly appreciate community support, it helps so much. Great job by the installation team. Fast, efficient and clean. Good job. Would recommend to others. Thank you for the prompt response. Your plumber was very helpful & friendly & did not leave until my wife was satisfied with his work. We will call again with future plumbing needs. Just wanted you to know how highly I think of you all. Your customer service is top notch & unbeatable. Your crew is spectacular. You have gone above & beyond in everything you've done & it is truly appreciated. On January 21st, your staff installed a new furnace in our home. We would like to tell you what a great team you have. They explained in detail about the installation, they continually worked until the job was done, cleaned up all messes and materials from the installation. Very careful in not tracking in dirt, overall a great job. The young man servicing my furnace & a/c was exceptionally nice & efficient. Recently we had a heater put in our barn and garage. The men sent to do the job were hard workers and efficient. We were pleased to see young people with a good work ethic and also pleasant on the job. You are a good company with good employees. I just wanted to take a minute to thank you for the wonderful service I received recently when I called your company when my furnace went out. Your serviceman came out quickly and diagnosed the problem in minutes. When he saw that it was a problem with a part being recalled by Carrier, he got me in touch with a Carrier dealer to take care of the problem. Being new to the area, we just choose your company from the phonebook. after this, we will certainly call you for any plumbing or heating concerns and will highly recommend you to any friends or neighbors needing such service. I would like to thank Thompson Heating for promptly coming out to our house on December 20th to determine that our furnace needed to be replaced and that the level of carbon monoxide in our house was not safe. You provided us with two space heaters for the night and came the next day to install a new furnace. It was also good that you realized the furnace was less than 20 years old and that Bryant was responsible for paying $950 towards the cost. Fortunately the balance was picked up by our First American Home Warranty that we had just purchased weeks before! Merry Christmas to us! Thank you for your very generous donation of Canned Goods to the Dundee Caring and sharing program. With donations like yours we continue to help the less fortunate with their groceries. These donations have been put in our Food Pantry for the continued ministry of distributing food to those in need within our community. 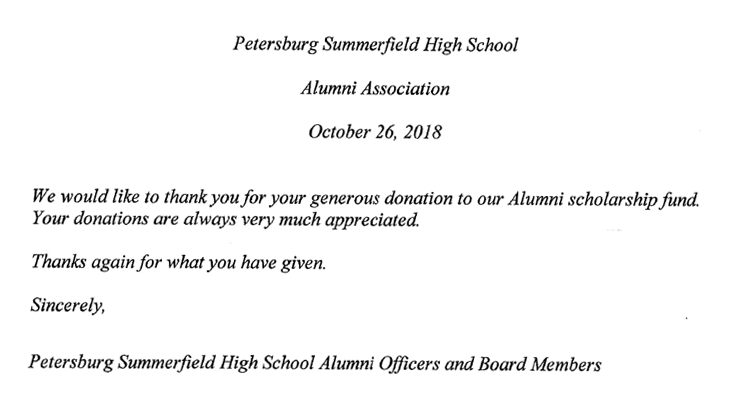 Thanks again for your generous donation and your support to our program. 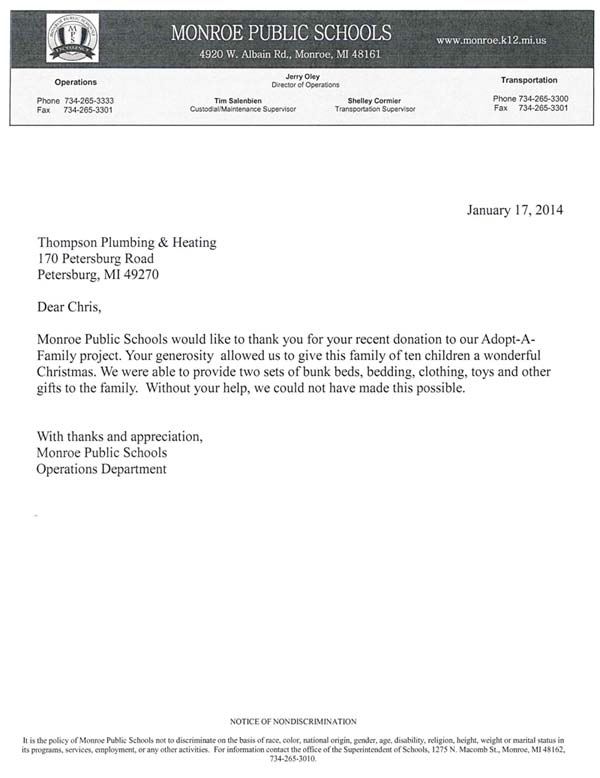 Thank you for collecting and donating food to our Dundee Caring and Sharing program. This helps with our monthly distribution of food to those in need within our community. Thanks again for thinking of us. Today 12/22/2009 at around 3:30pm I placed a call to you to have someone come out to fix our furnace. I was told that someone would be here by 5:30pm. At 5:15pm I received a call from Dave Palson who told me that he was just leaving Milan and that he would be here in about 10 minutes and he was! We have used Thompsons a few times in the past and have always been pleased with the work completed. However, this time was even better! Not only did we receive excellent service we also had Dave here. I have come in contact with many service people but none like Dave. He was very pleasant, took the time to explain exactly what was wrong, showed us the problem and fixed it very quickly. Not only that...he was also very nice to talk to. My wife and I enjoyed having him here. It\'s tough to find true customer service anymore, but we saw that in Dave. You have a true asset working for your company and he should be commended for his dedication to his profession and the way he handles his customers! We are very pleased and will continue working with Thompsons because of people like Dave! Please make sure that he has the opportunity to see this email and thank him for us!